Fourteen yachts moored outside Medway Yacht Club were struck and some were badly damaged on Sunday morning by a dredger in thick fog. Fortunately no-one was on board but on the south side of the river two MYC members, who had been sleeping on board their boat, were woken by the incident and reported what happened. 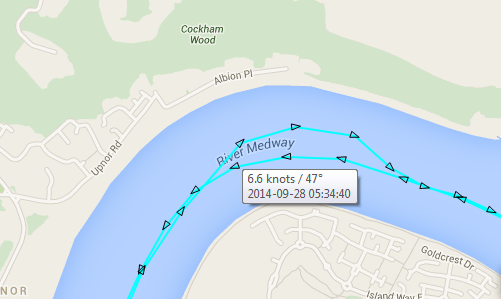 The AIS track shows that the 98 metre dredger Arco Arun went to the north side of the river on its passage downstream just after 06.30 BST doing 6.6 knots. Max Taylor, Deputy Harbour Master, informs us that MV Arco Arun has submitted a report to the Marine Accident Investigation Branch and Peel Ports will conduct an internal investigation in addition to reporting to the MAIB. Peel Ports has offered support to MYC and a representative from the vessel operator has been on site. One of the more unusual MSBA members is the group of enthusiasts who look after the veteran tug Touchstone, which recently had a refit. 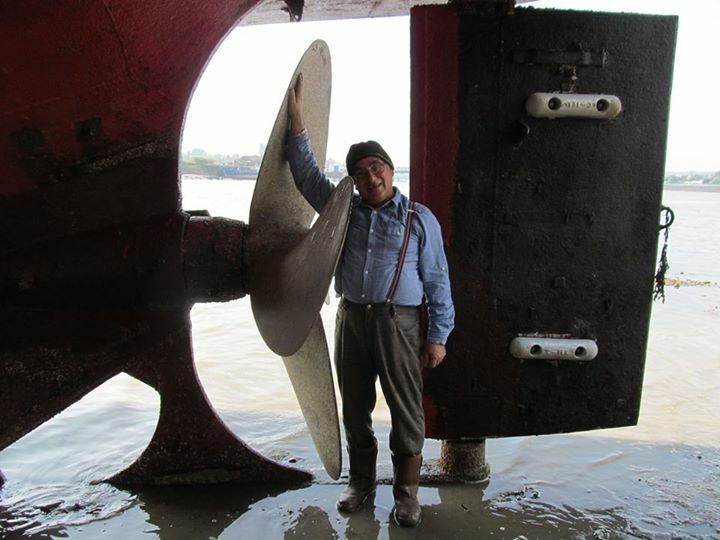 Pictured is Gerry, one of the tug’s regular crew, next to Touchstone’s huge propeller. Launched at Wivenhoe in 1963, until the early 1980s she was mainly employed towing petrol lighters from Thameshaven to Aylesford on the River Medway. At this time the tug was operated with a crew of four or five, plus up to four lightermen. The tug’s main engine is a compressed air start Lister Blackstone diesel of eight cylinders and 500 hp capacity. The hydraulic gearbox drives a 2 metre diameter 4 bladed propeller. Her tonnage is 68 tons gross and a deadweight of 110 tons. For more photos and news, see Touchstone’s Facebook page. Queenborough: good news at last! After some setbacks, there is good news at last! All three sections of the enormous 60m x 9m pontoon have arrived and are joined up, ready to install within days. Also the trot boat, Sheppey One, is now operational again after having its engine repaired. A second trot boat has now been purchased to avoid a repeat of the recent disruption to service. The Andrew Simpson Foundation is attempting to break the Guinness World Record by having “The Largest Sailing Race in 24 Hours (Multiple Venues)” Guinness World Record attempt. Keep away from the LNG terminal! 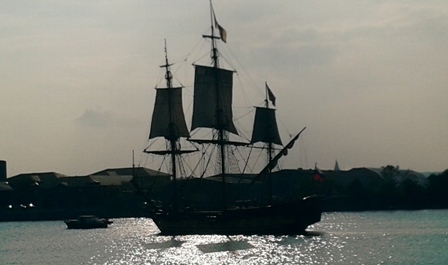 The Shtandart, a faithful replica of Russia’s first warship built for Peter the Great in 1703, has arrived in the Medway. The tsar, using the name Peter Mikhailov, learned the art of shipbuilding from Dutch and English shipwrights when Chatham dockyard was at its peak. Shtandart was accompanied as far as Rochester Bridge by the Medway Ports launch, then turned back and berthed outside Chatham Marina this afternoon. Several boats have been damaged this year on their moorings in Gillingham Reach and Short Reach. Max Taylor, Deputy Harbourmaster, suggests that owners report any damage to their vessels direct to Medway VTS (email navigation@medwayports.com or phone 01795 663025) and Kent Police, including the state and extent of damage (photographic evidence welcome), approximate time and any additional evidence such as unusual paint/scuff marks. One recent incident in Gillingham Reach left red paint on the damaged yacht. With luck Medway VTS may have a CCTV recording of the incident which will assist an investigation. Could your club use help from the RYA? Winter Workshop on 13 Nov at Medway YC is about Funding. This series of workshops covers a number of topics within Club Development and is your opportunity to hear the latest from the regional team of RYA Development Officers, meet other clubs and share good practice. 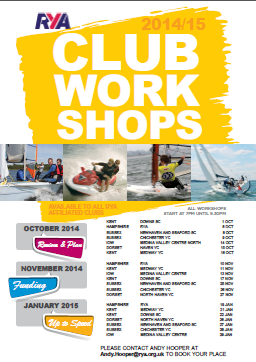 They are completely FREE for all RYA affiliated clubs. Chris Knibbs, secretary of Queenborough Yacht Club, informs us that the club’s open day on Saturday raised over £1600 for Macmillan Cancer Support. The event included a hog roast and boat jumble. Peel Ports in new economy drive?